America has historically had one of the world’s greatest arsenals of nuclear weapons on earth. Liberals have rued this fact and pointed to it as proof of some undisclosed plot within the bowels of government to destroy the world. Even more to the point, they blamed the vast nuclear capabilities of the United States for nuclear aspirations of other states. If only the U.S would disarm others would also was a common refrain heard from liberal academics throughout the 1970s and 1980s. Such was the logic of the looney left. The Weekly Standard ran a story this week on a speech by a State Department spokesman. Rose Gottemoeller, speaking at the Brookings Institute, claimed the U.S. had reduced its nuclear arsenal 85% from its cold war high and plans on further reductions but they “still have a lot of work to do” to reach their goal. That goal being “achieving the peace and security of a world without nuclear weapons..” While not committing to total disarmament, she did say the size of America’s future nuclear arsenal would be determined through negotiations with America’s allies. In other words, America is leaving it up to other nations to determine what its nuclear defense capabilities should be. Not only is the U.S. cutting the size of its nuclear deterrent, it has not invested in substantial upgrades of its arsenal since the cold war. Such is not the case with its most lethal potential adversaries. Giving up any pretense of following its Soviet Era treaties, Putin is committed to becoming a super power once again. Recent test of new generation nuclear cruise missiles and Intercontinental Ballistic Missiles (ICBMs) confirms Russian technology is now surpassing that of the U.S. Despite this, the big news is not what Russia has been up to, but recent advancements in China. China is not only an emerging market, but an emerging military power as well. With the help of stolen American technology, China is playing catch up to the United States. This is especially true in the area of nuclear weapons. Once unable to send a missile much further than its own borders, it now boast advance ICBM technology. Most of China’s missile know how can be traced back to President Clinton and his loosening of technology transfers to China. Other bits and pieces have been gained through its clandestine thefts of American designs. In a remarkable coincidence, as the State Department was commenting on U.S. resolve to remove nuclear weapons from the world, China was testing the Holy Grail of nuclear weapons, the MiRV missile. MiRV stands for multiple, independently targetable reentry vehicles and refers to the capability of outfitting a single ballistic missile with multiple war heads (See Business Insiders China’s New MIRV Ballistic Missile Is A Big Deal). 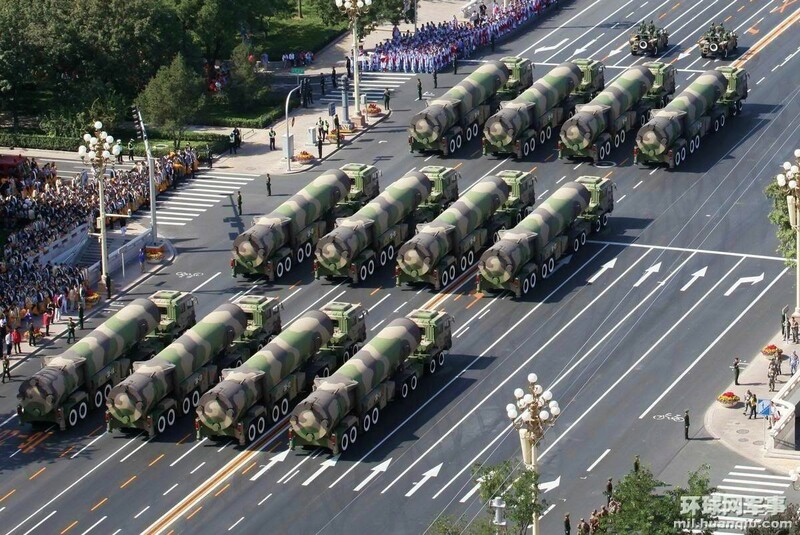 A huge leap in technology that means China has entered the big boys nuclear weapons club. Combined with its latest advancements in missile technology, China is a nuclear power that will now be able to hold’s own against the U.S. As the Asian giant continues its aggressive stance towards its neighbors, such developments can’t be seen as helpful for world peace. China has imperialistic ambitions that it keeps only thinly veiled. Driven by a belief that China’s destiny is to be the center of the world politically, economically and militarily, they are committed to becoming the world’s premier power. While the U.S. wallows around in a world of idealistic blindness, it is being left behind. Present plans to update America’s air, and, and sea nuclear defenses are decades behind. New bombers are not slatted for service until 2035, Minuteman 3 missiles are slowly decaying with no replacement on the horizon and the Navy is just now looking at updating its delivery systems. The Arsenal of Freedom is rusting while the those of its despotic adversaries grows. What little technological advantage still exists will likely be given away under Obama’s loose trade restrictions policy. God forbid that one day the U.S. is no longer a substantial deterrent to those with imperial ambitions. A day that, as of now, is inching ever closer.